Imagine an educational program that can improve students’ health, gets kids excited to learn science and math, and instills a love of nature? School garden programs can accomplish all of these feats and more. In fact, school gardens are sprouting up across the country, as educators and school administrators begin to realize their many benefits. For one, they are a hands-on and effective learning tool for teaching just about any subject, including social studies and language arts. In addition, gardens have multiple beneficial health impacts. Studies on children and adults show that gardening can increase the consumption of healthy fruits and vegetables, alleviate stress, and improve cognitive function. Plus, gardening gets kids moving outdoors. Finally, gardens teach responsibility, teamwork, and environmental stewardship. Children feel a sense of accomplishment and awe as they witness a tiny seed grow into a sprout, and eventually, a plant bearing fruit. Whether you’re looking to start or expand an existing school garden program, now is the best time. With the beginning of the schoolyear, many school garden grant opportunities are now live and accepting applications. Check the list below to see if any of the programs are a match for your school. (The list includes national programs and those specific to my own state of Florida.) You can also check out the USDA’s “People’s Garden” web site, that has a searchable list of funding opportunities for different types of community and school gardens. In addition to getting funding for your garden, check out the many resources on the internet for how to create a program at your school, like this awesome guide published by the USDA. (Hint: the first step is constructing a Farm to School Team of interested parents and school staff). Finally, contact your local Extension Office (a national educational network concerning agricultural matters) for specific information about which crops will do best with your state’s climate. The Whole Kids School Garden Grant program provides a $2,000 monetary grant to support an edible educational garden on the grounds of a K-12 school. Schools, or a non-profit organization working in partnership with a school, may apply. Since the grant program started in 2011, garden projects at more than 2,110 schools have received funding. K-12 public, private, and charter schools are eligible to apply for a Community Grant ranging from $250 to $2,500 in four core areas of giving: Hunger Relief & Healthy Eating, Sustainability, Women’s Economic Empowerment, and Opportunity. Schools can apply under the “Healthy Eating” core area. Potential grantees should located within the service area of the Walmart store, Sam’s Club or Logistics facility from which they are requesting funds. This grant opportunity will be going live later this fall. Make sure to check the web site so you won’t miss it. This grant opportunity will re-open in November, so be sure to check back then. This one is not a grant, but a great fundraising opportunity provided by a partnership between Slow Food USA and Chipotle. Chipotle will host an in-restaurant fundraiser where 50% of the sales are donated back to the school. Chipotle can also donate food for a school garden fundraiser taking place at the school. They can also provide free coupons and materials you can use. Florida Agriculture in the Classroom, Inc.’s Teacher Grant program strives to fund classroom projects that teach Florida school children about the importance of agriculture and introduce them to agricultural producers and representatives in their areas. The grant is open to general education and agri-science teachers in pre-K through 12th grade who want to use agricultural concepts to teach core subject areas. Deadline: September 30, 2016. Only the first 40 complete applications will be accepted. In addition to the Florida Farm Bureau, County Farm Bureaus may also disburse funds for school garden programs. Check the web site of your county’s farm bureau for more information. To find it, Google the name of your county plus the term “farm bureau” (example: “broward county farm bureau”) or call them directly. The Technology Education Research & Redesign Alliance’s (TERRA) Mini-Grants are intended to support school-based projects in grades pre-K through 12 that utilize technology in a new and innovative way or sustainability initiatives seeking to encourage and support creative, local environmental education and stewardship activities. Categories: Did You Know, School Gardens | Tags: community gardens, healthy eating, healthy kids, nutrition, School Garden | Permalink. Gosh, I love gel manicures. No chips for weeks?! Fewer visits to the salon?! Super shiny nails?! Gel manis are a busy girl’s best friend. But are they too good to be true? Since making their entrance, gel manis have been under scrutiny. Some medical studies have shown that they may be bad for you health. The goods news is that the risks are small, and there are ways to minimize them further. Read on for the potential risks and my tips (get it?!) to making gel manicures a safer option for your health. When you dry your nails, you’re exposing your skin to UV rays, which can increase your risk of cancer. According to a 2014 study, the UV exposure from nail dryers is “small,” but dermatologists cannot definitively deem them as safe because they do emit UV rays, after all. Furthermore, nail lamps can cause DNA damage to skin that can lead to premature aging. In sum: taking steps to protect the skin on your hands is a good idea. How to minimize the risks? Find a salon that uses LED lights instead of machines with UV lights. LED lights dry your nails much quicker (45 seconds vs. 3 minutes) and emit less radiation. Most newer salons use LED technology, but you should always ask first. Coat the top of your hands with sunscreen before drying. Wear photoprotective gloves with the tips cut off! (To be extra safe, you can wear the gloves after applying sunscreen.) You can buy sun-blocking gloves like these or use a cheap pair of regular gloves, which will still let some UV rays through, but less so than if you don’t have them on. Remember: put the gloves on BEFORE the technician polishes your nails, so you don’t smudge! Use an at-home kit. These kits usually don’t require a UV light (though your mani will probably not last as long as the salon version.) You can even use your favorite regular polish and seal with a Gel coat like this one or use a Gel polish kit, like Essie Gel Couture. Many nail polishes contain cancer-causing and endocrine-disrupting chemicals like butylated hydroxyanisole (BHA), triphenyl phosphate (TPHP), and formaldehyde. A Duke study found that such chemicals are absorbed into the body just hours after their application. According to the Environmental Working Group (EWG), some brands don’t list all the ingredients of their polishes on the bottle, so it’s hard to even know what you’re being exposed to. How to minimize your risk? While several nail polish brands have removed some of the harmful chemicals from their products, I have not specifically seen this done for gel polishes. Which means that if you want to minimize your exposure to the toxins in gel polish, you’ll have to get fewer gel manicures. (Sorry ladies). Save the gel manis for special occasions; in between, opt for regular manicures using polishes that are made from safer ingredients from brands like Gabriel and butter London. To remove gel polish at the salon, you have to soak your nails in an acetone-based polish remover for at about 15 minutes. Acetone is a known toxin. Though exposure via polish remover is low and unlikely to be dangerous, I still try to avoid soaking my nails in acetone, especially for the many minutes required to remove gel polish. Remove gel polish with acetone-free remover. You can do this at home, or bring your acetone-free polish remove with you to the salon. I’ve successfully removed gel polish at home by soaking my nails in acetone-free polish, and it works great! How? I cover each finger nail with a piece of cotton soaked in the polish remover, and then I wrap each finger tip in foil (just like they do in the salon). Wait 15 minutes. Remove foil and the polish should be coming off. If not, soak for a few more minutes until it does. Leaving polish on for an extended period of time prevents oxygen transfer to the nail, and can result in discoloration, thinness, and brittle nails. Additionally, the scraping and peeling that often happens when you’re trying to remove the polish can damage the nail bed. Moderation is key. Dermatologists recommend not leaving polish on for more than 3 consecutive months. Remember to give your tips a break every so often, and use protective ointments to sooth and hydrate your nails. Categories: Did You Know | Tags: Gel manicure, manicure, Safe polish, toxin-free polish | Permalink. Many of us are aware that house paints once contained lead, but few of us realize that Halloween face paints can contain lead and other heavy metals. The FDA does not test makeup to ensure that it is free of heavy metals and few retailers list all the ingredients on packaging. The Centers for Disease Control and Prevention (CDC) has not identified a safe blood lead level in children, and even low levels of lead in blood have been shown to affect IQ and cognitive functioning. In sum: Lead is a known neurotoxin. The solution to the problem is to buy safe face paint for your kids. There are brands that pledge they do not use lead and other heavy metals in their products. Amazon: they have several available kits on Amazon, including the Angel Fairy Princess set, the SCI-FI Robot set, or the Fantasy Butterfly set. From their web site: Order HERE. Enter coupon code Halloween15 for a 15% discount. They offer several expedited shipping options. If you order from their site before 4pm CST, they will ship out the face paints that day. Select Priority Shipping for 2-day shipping for $6.50 to get it before October 31st! (Overnight shipping is $19.50. If you need same-day/expedited shipping contact them at 719-205-4480 between 9 a.m. and 5 p.m. CST or include in the comments section on the site). 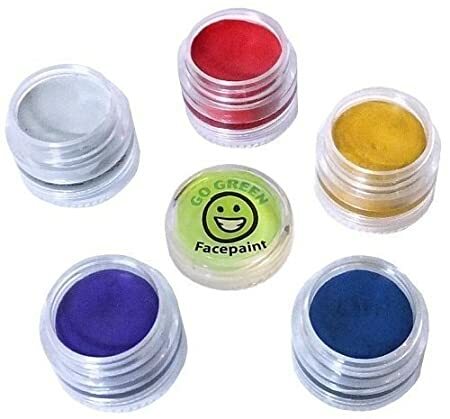 Another option is Go Green Face Paint, which you can buy on Amazon. Whichever option you buy, do your research, first. Read the product description and call the manufacturer if you have any doubts, and…Have a SAFE and fun Halloween! P.S. This is an unbiased review. I am not receiving any reward from any of the manufacturers recommended above. Categories: Did You Know, Review | Tags: face paint, Healthy Halloween, lead free face paint | Permalink. 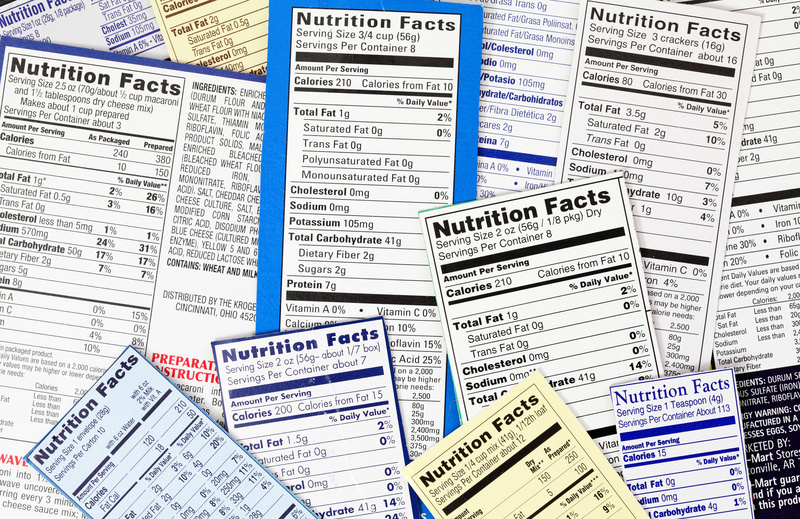 If you’re used to judging how healthy a food is simply by reading its nutrition label you may be surprised by what you find. Some highly processed breads and cereals, for example, appear to be healthy for you because they have lots of vitamins and minerals. As an example, let’s compare the nutrition label of Lucky Charms–a highly processed and synthetically enhanced cereal–to the label of a much less processed breakfast food, such as Bob’s Steel Cut Oats. 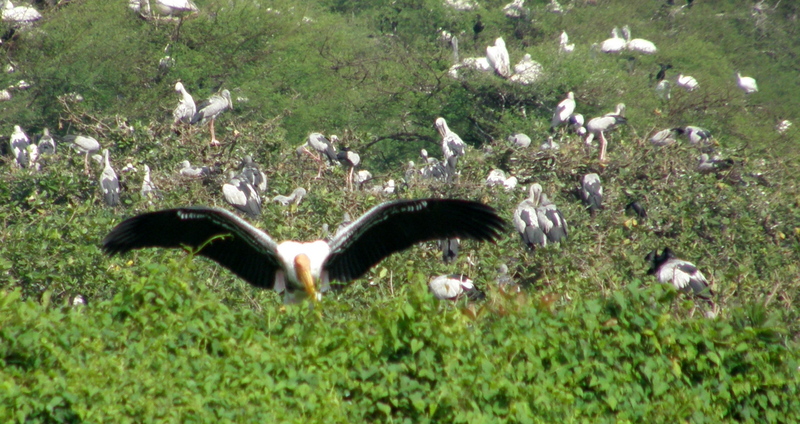 Look at the images below–which looks more impressive? Lots of vitamins and minerals in these Lucky Charms! Bob’s Red Mill Steal Cut Oats…no vitamins, some minerals, but minimally processed. Steel cut oats still have their hull (outermost layer intact) and are not steamed and rolled. Naturally,you may say to yourself, “the Lucky Charms are healthier and taste better, so it’s a no brainer—I’m buying them!” Right? Naturally occurring nutrients are always better for us than the synthetic version. They are better absorbed by our bodies, they include a whole variety of micronutrients that are not reflected on the nutrition label, and they will tend to have more protein and fiber. Just as food companies have never been able to re-create breast milk with sythentic formulas, so, too, can we not create fake foods that are as beneficial as the real thing. Does the ingredients list include colors, letters, and numbers? These are a sign that the product contains artificial colors, flavors, preservatives, monosodium glutamate, and other synthentic substances, that are designed by food companies to make us enjoy and crave their foods, but have questionable effects on our health, and certainly tend us toward obesity. If you want a more complete list, take a look at the Environmental Working Group’s “Dirty Dozen Guide to Food Additives“–the list includes ingredients that have been associated with serious health concerns. Print it out for your next shopping trip. What is the fiber and protein content? Whole grains will always have more fiber and protein than processed versions. In addition to being essential for body function, these nutrients are heart, gut, and brain-friendly, are filling, and stabilize our blood sugar–which means, less mood swings and less cravings. Ideally, you want products that contain at least 3g of fiber and protein (each), per serving. Do the words “fortified” or “enriched” appear in the ingredients list? Then you know the food is so processed, that the food company is trying to sell you a nutritionally empty food by adding in synthetic nutrients. 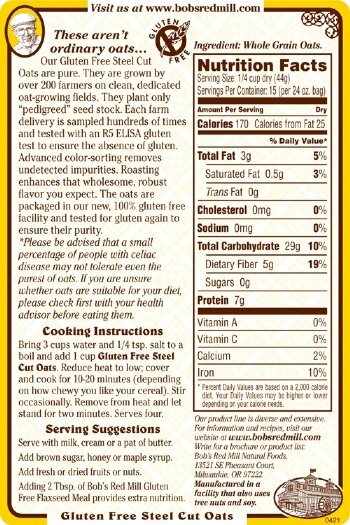 Do you see the word “whole” next to the grains listed in the ingredients list? Whole grains are better than refined ones because they provide lasting energy and stabilize blood sugar. Ideally, you want to see “whole [name of grain]” or “brown rice” when you read the label. If the label says “wheat” or “multigrain,” some parts of the grain may be missing. “100% whole [grain]” is the best. Check out this handy chart for determining whether the grains in the product are really whole or processed. Going back to our Lucky Charms vs. Steel Cut Oats comparison, we can used this checklist to draw the following conclusions for why the Oats are a better choice: They have more than twice the amount of fiber and over three times the amount of protein per serving. They are made of whole, unprocessed grains. Lucky Charms may have some whole grains in them, but they are full of high fructose corn syrup, artificial colors, flavors and preservatives, and probably all of the micronutrients are synthetically added. Bob’s has 10% Daily Value of iron and 2% of calcium, naturally. These numbers may seem low, but in the whole, original form, nutrients are better absorbed and produce a better effect in our bodies than do the fake ones. This may seem like a long check list, but after some time it will become second nature. You will find that ten seconds is enough to scan both the nutrition and ingredients labels to make a good choice for you and your family. Categories: Did You Know, Healthy-eating tips, Shopping Guide | Tags: nutritional labels, processed foods, whole foods | Permalink. Back in 2013, I wrote a post on the relatively high levels of arsenic found in rice. Consumer Reports had just published a study that found “worrisome levels” of this carcinogenic toxin in rice products, including many baby foods. I was shocked to learn that many foods contain a higher quantity of arsenic than is legally permitted in drinking water. Children are disproportionately vulnerable to exposure–because of their low body weight, a particular quantity of arsenic impacts them much more than it would an adult. Gluten-avoiders, too, are at risk, since so many gluten-free products contain rice. Consumer Reports has now issued an updated report based on data (provided by the FDA) concerning the inorganic arsenic content of 656 processed rice-containing products. The great thing about this new report: it contains a point system that can help you determine how many servings of rice and rice products are safe to consume on a weekly basis. Even better, the recommendations are made separately for children and adults. Below are the “New Rice Rules,” which assign a point value to different rice-based foods. Consumer Reports recommends no more than 7 points per week, and the “risk analysis is based on weight, so a serving of any food will give children more points than adults.” I highly recommend reading the entire updated report here, and watching their brief video summarizing the issues. Wash and cook rice in lots of water! Wash and pre-soak rice in water, use extra water when cooking (Consumer Reports recommends 6 cups water per one cup rice), and drain excess water at the end. Unfortunately, this process washes out some of the nutrients from the rice, but it reduces about 30% of the arsenic. Origin matters; Organic does not. Rice grown in CA has the least arsenic; rice from Texas has the most. Try buying imported jasmine and basmati rice from India and Pakistan, as these tend to have lower levels or arsenic. 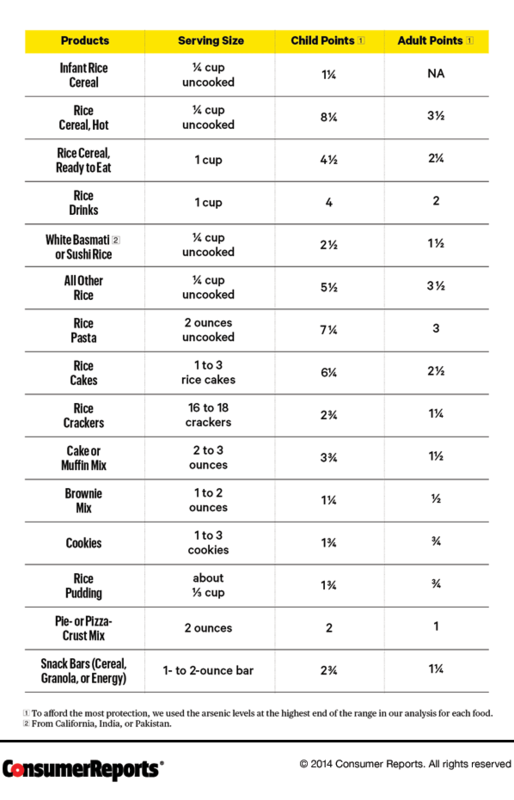 The 2012 Consumer Reports study listed the origins of the rice samples it tested, so you can use this table as a guide when purchasing rice. White rice, thought not as healthy, tends to have less arsenic than brown or wild because arsenic accumulates in the outer layers. These layers are removed when making white rice. 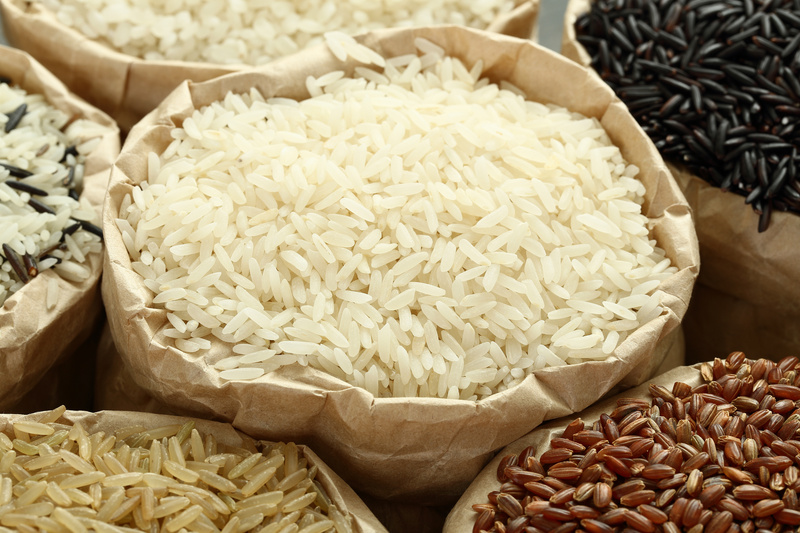 Given these findings, its best to limit rice intake as much as reasonably possible. In my next post, I’ll provide lots of great alternatives to rice and rice products. These are especially relevant for gluten avoiders, since most gluten-free products contain rice. Categories: Did You Know, Healthy-eating tips | Tags: arsenic in rice, gluten free, rice products | Permalink. Do you realize that you have the power to carve out a safe space for your family? A space that is free of toxic chemicals, heavy metals, and other hazardous substances? That space is your home. Wherever we go, we’re constantly being bombarded by toxins, pathogens, and electromagnetic radiation. As a society, we’re only beginning to understand what this means for our health. Studies of specific toxins have shown that repeated exposure can damage our immune, nervous, and endocrine systems, particularly those of children, who are especially vulnerable. We are regularly exposed to over 70,000 newly developed synthetic chemicals that have never been tested and whose potential dangers are unknown.The list of environmental toxins we encounter on a daily basis includes air pollution, lead, formaldehyde, BPA, pesticides, flame retardants, mercury, and much more. Toxic overload– along with poor nutrition, sedentary lifestyles, the overuse of antibiotics, and other factors– may explain why children today have so many allergies, weight problems, neurological deficits, and behavioral challenges. It may explain why, as a generation, they are “compromised.” Too much of a bad thing can’t be good. I once heard Master Herbalist Andrea Candee say, “My home is my sanctuary.” She had been discussing her rationale for not having wi-fi devices in her home. Everywhere else, she explained, her family members are bombarded with electromagnetic radiation. But, at home, they get a break. Though we can’t protect ourselves from every health threat, our homes are the only places in the world where we have some control over the environment. Just as we think of sanctuaries as a safe haven for endangered animals, so, too, should we think of our homes as our own special, safer, place. In our homes, our bodies can get a break from the deluge of toxins, pathogens, and radiation that strikes us when we are outside. We get the chance to rejuvenate. This philosophy, “my home is my sanctuary,” guides the decisions I make about the foods we eat, the products we use, and the things we do in our home. It explains why I have a no-shoe policy. It explains why I make every effort to keep out pesticides, heavy metals, phthalates, BPA, formaldehyde, PVC, VOCs, corn syrup, food coloring, and other potentially hazardous foods and substances. These limits at home enable us to enjoy all sorts of treats and activities that the great world has to offer us. Outside the house, my kids can eat almost anything, they get dirty, and my son crawls around grubby floors in play areas and waiting rooms. We even invoke the “3-second rule” when teething toys or snacks fall on the floor. We get to roam free without worrying too much about germs and other hazards, because having a “sanctuary” means that we’ll have a chance to repair and rest when we go home. And, we are healthy. While my kids get exposed to all sorts of germs and viruses when we go out (which, studies have shown is important in the development of a stronger immune system), they’ve never been hospitalized or taken antibiotics. My home is my sanctuary. It’s a safe haven I carve out for myself, my spouse, and my little ones, based on the trade-offs I am most comfortable with. Think about what your trade-off’s are: What’s most important to you? What can you give up? Make your home your sanctuary. Categories: Did You Know | Tags: environmental toxins, healthy kids, healthy living, pesticides, toxin-free | Permalink. Since having kids, we’ve instituted a no-shoe policy in our house. My three-year-old daughter is so used to this, that she immediately takes off her shoes whenever we go to someone else’s home, and she’ll often ask me why others aren’t doing the same. I always find it awkward to ask guests to remove their shoes and it feels like an imposition. They just arrived and here I am making a demand of them! I am aware of the nuisance, but I have good reasons for it. Studies have shown that people track in all sorts of harmful toxins from outside the home when they walk into the house without removing their shoes. These toxins persist in the air in the form of dust, which is inhaled and absorbed by our skin as it settles on the floor and furniture. Chemicals stay in the air and on surfaces longer in our homes than they do outdoors, where the sun and rain help break down pesticide residues. Children are more highly exposed to these chemicals. They spend most of their time on or near the floor, and can breathe in and touch chemical-laden dust or soil tracked in by shoes. Little kids who are constantly putting their hands and other objects in their mouths can ingest these dangerous particles, too. In addition, the infant breathing zone nearest the floor is less ventilated than the adult breathing zone. Now, let me tell you a little about the toxins we’re literally walking into our homes. These chemicals include pesticides and herbicides that are sprayed on lawns and gardens (they can remain on the lawn for up to a week after application). An EPA study found that 85% of the total daily exposure to airborne pesticides was from breathing air inside the home—a result of both indoor use of such chemicals and track-in. At least a few studies have focused solely on tracked-in chemicals and their persistence in homes. For instance, a 1996 study found that the weedkiller 2,4-D used to treat lawns could persist in carpet dust up to one year. Pesticides have been repeatedly linked to cancers, tumors, and neurological disorders, among other things. The EPA has warned that lead, mercury, and gasoline can also be tracked into our homes from soil outside that is contaminated by deteriorated exterior lead-based paint and other lead sources, such as industrial pollution and past use of leaded gasoline. Lead and other heavy metals have been linked to neurological problems, particularly in the developing nervous systems of children. And then there is coal tar, a known carcinogen used in driveway sealants, which is tracked into homes from driveways and parking lots. Even the US government is concerned about the carcinogenic nature of coal tar and the dangers it poses to people and especially children, both outside and indoors. These are just a few of the toxins we regularly track in with our shoes. There are many others. For instance, just this week I read in the news about a trend of young soccer players developing cancer, potentially due to their frequent contact with, ingestion, and inhalation of the black crumbs found in most artificial turf. If your and/or your kids play sports on synthetic fields, you’re tracking these potentially hazardous particles into your home, too. For those who come to my home: I have slippers available so no one has to go barefoot. (As I’ve learned from my readers, it’s important to offer indoor shoes, particularly for guests with medical issues.) I hope that makes your stay a little more comfortable. Categories: Did You Know | Tags: environmental toxins, kids at risk, toxins in our home, tracking | Permalink.